The Steam gaming platform has a feature that displays the time a game has been played by a user. You can look up your times and the time your friends have played a particular game. But the time tracking is limited to games on Steam, which limits the usability significantly as it excludes web browser games or games that are not integrated into Steam. 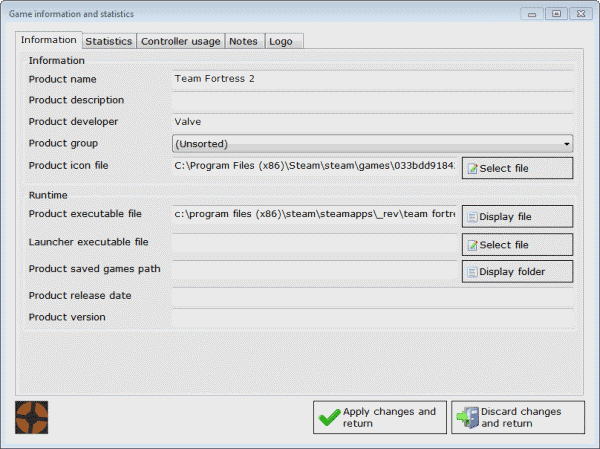 The free software Gameplay Time Tracker tops Steam's time tracking capabilities by supporting pretty much any game that is playable on the PC. The program runs semi-automatically in the background. It monitors fullscreen applications on the system automatically assuming that all of them are games. A blacklist is provided to block certain fullscreen applications which are not games, or games that you do not want tracked, from being tracked by the application. It is furthermore possible to add games to the whitelist, which can be handy to monitor games that are not automatically recognized as such by the Gameplay Time Tracker application. The third monitoring option supports browser-based applications. This works by adding websites to the browser-based applications list. Supported are the four major web browsers Microsoft Internet Explorer, Mozilla Firefox, Opera and Google Chrome. Detected games are added to the database automatically. It is still up to the user to add information that are not filled out by the process. This may include a product description, notes, the game save folder or the release date of the game. Game statistics are displayed for all games in the My Games tab in the program interface. The tracker lists the program name, total and last run time as well as the total number of times the game has been started on the system. The daily statistics tab confusingly displays statistics for the last 365 days of gaming. Here it is possible to display the full game run time per day, the daily game run count or controller specific statistics. A right-click on the program icon in the taskbar displays a context menu with options to launch the main program window or to stop or restart the game monitoring. Users who do not want their input devices monitored can disable this feature in the program options. There they can also disable the autostart entry. 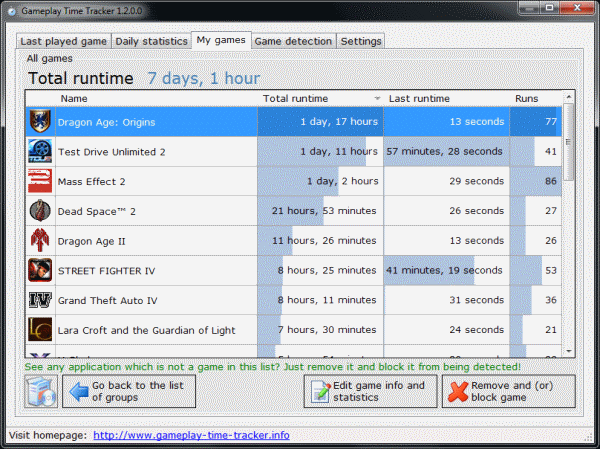 Gameplay Time Tracker can be helpful for users who would like to monitor the time they play games. This can be useful to control the gaming to avoid spending to much time gaming. Windows users can download the latest version of the game tracker from the developer website. The program is compatible with 32-bit and 64-bit editions of the Windows operating system. It was tested on a 64-bit edition of Windows 7. Or you can log join raptr.com gamers’s social network and download their tool to keep up with your friends gametime and compare it to yours.